A unique formulation using specially developed enzymes to completely dissolve the hair that causes blockages in bathroom plugholes. Use this in baths, showers and sinks to unblock and refresh your bathroom plugholes. Unlike other bathroom unblockers that rely on strong caustic chemicals, which can release toxic fumes, the Ecozone Bathroom Plughole Hair Unblocker is free from corrosive and caustic ingredients making it safe for you and your plumbing. The bottle contains 2 concentrated applications to tackle even the most stubborn of bathroom blockages. Just leave overnight mixed with warm water. Buying this product will earn 56 Loyalty Points. 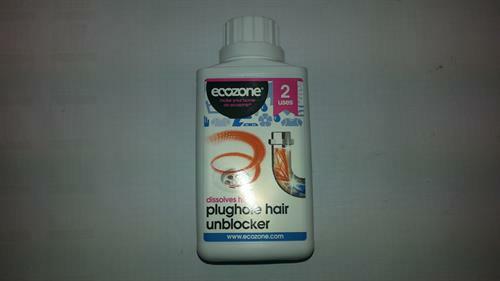 Be the first to submit a review for the Ecozone Plughole Hair Unblocker.